Welcome to Conch’d Out - a beachfront vacation 2BR house and optional 1BR cottage on a secluded beach with sandy entry, clear blue water and beautiful coral reefs just offshore. Conch'd Out is situated on a 2 acre coconut palm covered point with magnificent 270 degree views and access to great beaches on either side. It is located on the acclaimed Banks Road on the Atlantic side of Eleuthera near the quaint settlement of North Palmetto Point. The main house has two bedrooms, each with a private bathroom, and sleeps up to six. The upstairs bedroom has a king bed. The second bedroom is downstairs and accessed via external stairs,. It has two queen beds and a patio...perfect for privacy (but perhaps not for very young children). The nearby one bedroom, 1 bath cottage has a king bed, and sleeps two. Both house and cottage have queen sofa beds in their great rooms and fully equipped modern kitchens. The house and cottage are both very comfortable and well maintained with ocean views from every room, fully air conditioned, wireless internet, and satellite TV to make you feel right at home. A cistern backs up the city water supply. The house may be rented alone or together with the cottage (+$700/week). The cottage is never rented separately. Please no Sunday arrivals, departures OK. 50% deposit to secure reservation-balance due 60 days prior to arrival. Amenities, Activities & Area: Local caretaker, wireless high speed Internet, fully air-conditioned, fully equipped modern kitchen - including dishwasher, coffee maker and microwave, all linens, towels and beach towels provided, Two kayaks, satellite TV/VCR, CD player, phone with free local calls, washer and dryer, BBQ grill, outdoor showers. Stores and restaurants are nearby. Snorkeling, swimming, diving, fishing, golf, and sightseeing. Conch'd Out is located in North Palmetto Point, 6 miles south of Governor's Harbour on the Atlantic side of the island. The Ashcraft family ( Father and three sons)purchased the property in 1995 and built the house and cottage in 1999. Since then we have enjoyed Conch'd Out with family and friends and rent the property to allow others to appreciate the beauty of the location and enjoy the island of Eleuthera. The Ashcraft family spent many years cruising the Bahamas , fell in love with Eleuthera, and decided to jointly buy and build a home. Conch'd Out is uniquely located in the middle of Eleuthera on a small coral point, slightly elevated, and well separated from other houses.There is access to beaches on each side of the point with sandy water entry. The beach sand is "always" there, as opposed to some other areas on the Atlantic side that experience occasional erosion. A Palapa is located on the tip of the point-allowing spectacular 270 + degree views up and down the coastline. Conch'd Out is located right on the beach. A drip coffeemaker and an espresso machine is provided. On a little peninsula, this property has about 210degrees of ocean views. Stunning. There are steps to two beaches. Reefs just offshore. A very comfortable hammock. The house is nice, has all the essentials. Andrew and Rita (the caretakers) are wonderful. Great house and even better location. Our family of five was very comfortable, cooked almost every night, snorkeled out back everyday. Located in the middle of the island, you’re reasonably located to anything. House is clean and well stocked. Definitely rent a car and Andrew makes it very convenient. The owner is very responsive. You won’t regret staying here. The Cottage property is well maintained, clean and very homely feeling. Just steps away from the sand. Amenities and helpful caretakers and owners made our stay an excellent Bahama experience. Great snorkeling swimming spot! We enjoyed 1648 restaurant (great lobster pasta and Pina Colada's), Shipyard (great conch burger and sweet potato fries), and the Fishbone (delicious fish tacos). Thanks to Conch'd out for a wonderful home away from home vacation. We have stayed at Conchd Out before and we enjoyed our stay just as much this time as in the past. 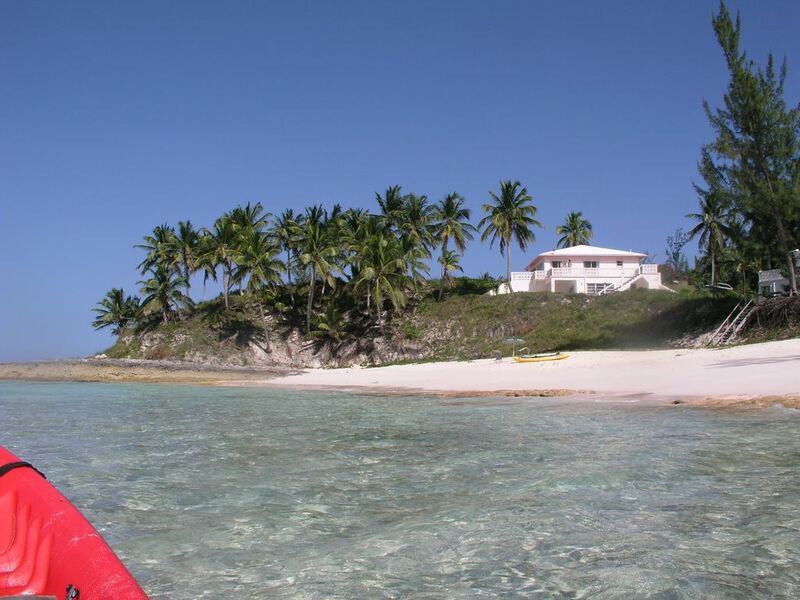 The house is on the best beach on the island for swimming, snorkeling, and kayaking. We visited many of the “must see” beaches on the island and this one is still my favorite. The reef just in front of the house is gorgeous. We were able to see turtles, lobsters, conch, tons of brightly colored reef fish, and even a dolphin right at Conchd Out! My family and I appreciated the well equipped kitchen and the clean and comfortable house. I loved beginning each day with a cup of coffee at the palapa overlooking the ocean. WiFi and Satellite TV were really nice to have on rainy days. The caretakers, Andrew and Reta, were friendly and kind and went out of their way to make sure our stay was perfect. Conch'd Out was not what we expected, it was even better. The views are breathtaking and the warm tropical breezes are refreshing. We enjoyed sitting on the beach catching some rays and cooling off in the clear waters. Andrew & Rita could not have been better to us. Andrew went out of his way to make us feel wecomed and at home. He even cut some coconuts so we could get the coconut water, jelly, and raw coconut. Al of the restaurants he suggested were right on. Pammys was adelicious lunch several days. All in all a great get away. Eleuthers is truly a "Hidden Gem" in the Caribbean. Incredible view in two directions, lovely house and very well appointed kitchen. We had a great week. Conch’d Out is easily accessible- just one hour by air from Miami, Fort Lauderdale, and Nassau to Governor's Harbour (GHB) airport or North Eleuthera airport (ELH) . Our comfortable and well-maintained home is right on one of the most beautiful and secluded beaches in the world. This location makes a perfect playground for children of any age. You can enjoy exploring the fascinating coral reefs just offshore, catch a fish or spear a lobster for your dinner, enjoy world-class bone fishing, or charter a boat for deep-sea fishing. Two 2-person and one child kayaks are provided for your enjoyment. The people of Eleuthera are extremely friendly and hospitable. The island has many interesting places to visit and deserted beaches to explore. Conch'd Out, in North Palmetto Point, is located mid-island, cutting down on the time and expense of gas when sightseeing. And our attentive local caretakers, Andrew and Reta Bethel, will make sure that your Bahamas holiday is a memorable one. House: $1750-$2100/week - 6 guests maximum Add Cottage $700/week - 2 guests maximum The Cottage is only rented in conjunction with the House. Flexible Arrival and Departure dates. Sunday Arrivals not permitted. Holiday rate changes. No additional per-person, damage deposit fees or other surprises.